They say the devil is in the details, meaning 'there is a mysterious element hidden in the details'. I agree. 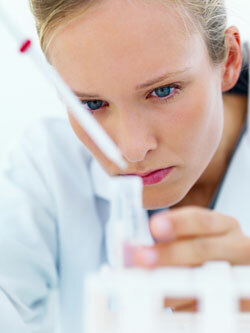 It is exactly the 'going into detail' part that makes creating skin care products a fascinating process for me. Hydrosols are some of my absolute favorite components to work with, and mixing them is kind of like composing a pastel-like, fragrant liquid that nourishes, tones and balances the skin. You can't go completely wrong (for the most part), but if you really get into the finer details and keep tweaking, you can achieve nothing less than skin-loving magic. I have been working with a combination of Neroli (also called Orange Blossom) and Carrot Seed hydrosols for a few weeks, tweaking the proportions and trying to find the perfect balance of function and scent. After making several batches and getting as far as I could get with these 2, I decided to explore adding a third element. Not that the original combination doesn't work – it's great. I just want to refine the mixture so it has a bit more 'depth' – both in the way it performs as a tonic, but also in the way it 'greets the nose'. 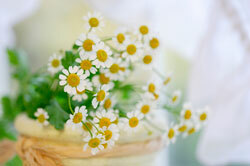 Chamomile (INCI: Chamaemelum Nobile, also Anthemis Nobilis) brings calming and soothing properties to this mix, complementing and boosting the toning and skin-softening qualities of the other 2 hydrosols. Scent-wise, chamomile brings an apple-crisp, floral quality (with the merest whisper of earthiness) to this otherwise sweet and earthy combination. Of course, sometimes a combo that may sound good 'on paper' turns out to be an absolute disaster. Some hydrosols just don't like working together, and will make that perfectly obvious by changing scent to something less desirable immediately after being mixed. Other times, they may start out playing nice, but will then sit around in the bottle, grumbling at each other for a while until a full scale fight breaks out, resulting in an ugly-smelling product. This time, the mix has (initially) taken on the properties I was hoping for – creating a more complex scent. It will be interesting to see if these 3 hydrosols continue to get along throughout the week. Som altid meget spændende og velskrevet læsning her hos dig! Ih, tak Rikke! Man rødmer da helt!